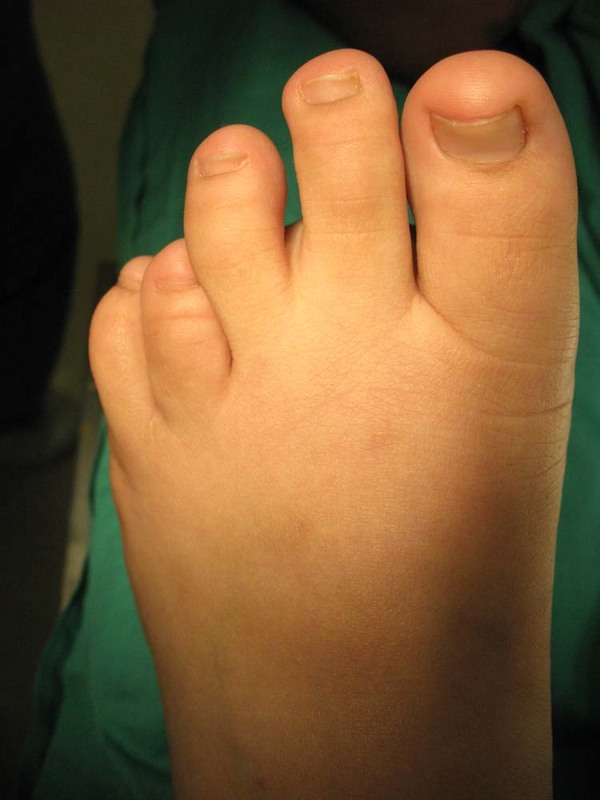 Brachymetatarsia is defined as congenital shortening of the metatarsal caused by premature closure of the epiphysis. 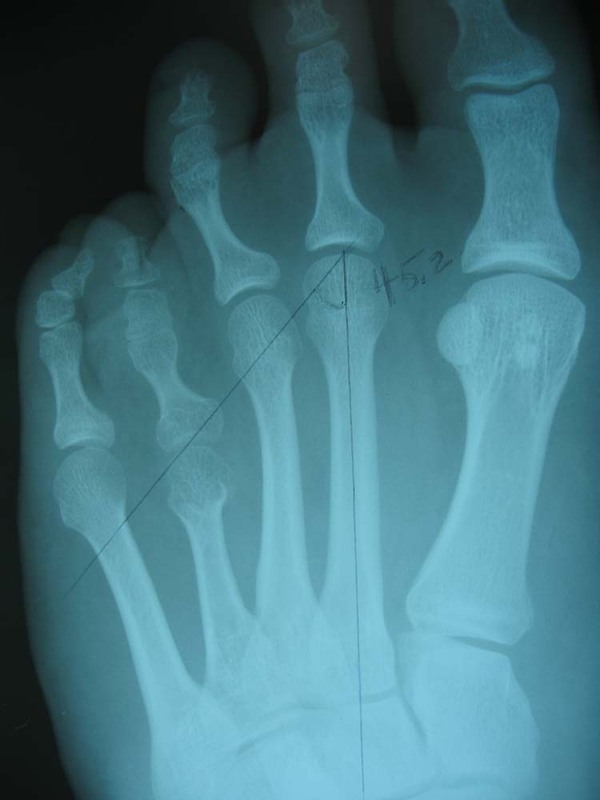 The condition most commonly affects the fourth metatarsal of young and adolescent females. Correction of this deformity is either by callus distraction using an external fixator, or by one-stage surgical lengthening procedure using autogenous iliac bone graft. A case of brachymetatarsia is presented that is corrected by one-stage cadaver bone graft sterilized by the Biocleanse ® method. 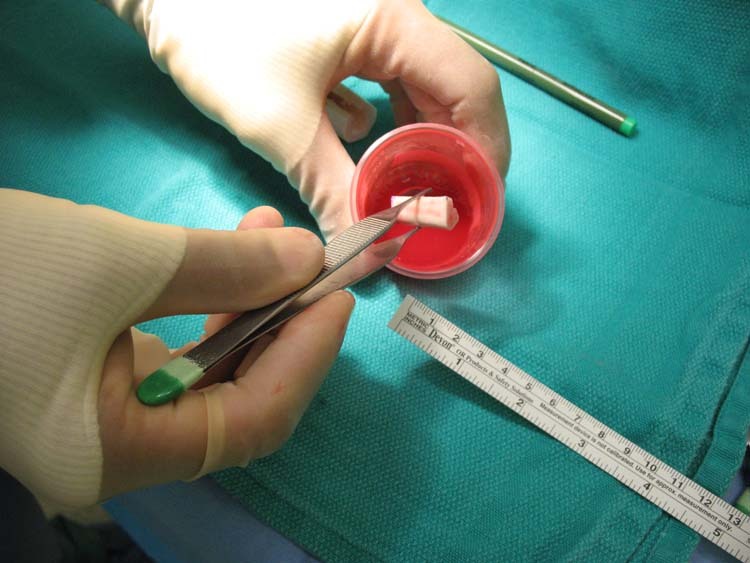 Advantages include complete incorporation of the graft and healing characteristics similar to autogenic bone grafting without the need to harvest graft material. It has been reported that the fourth metatarsal is more likely to be affected by this condition, although many studies vary in their reports. [3,4,10] The majority of cases are seen in females (98:4 female to male ratio respectively) and 72% of these cases occur in both feet. Brachymetapody, a noticeable shortening of the toe, can also present with brachymetatarsia. 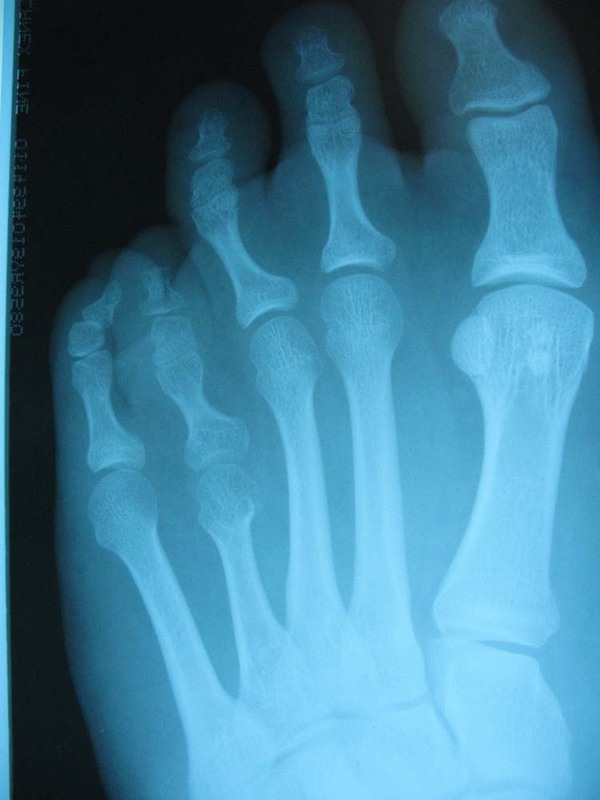 Figure 1 Initial presentation of brachymetatarsia of the fourth metatarsal. Typically, the 4th toe is short and contracted due to the immature growth and congenital shortening of the fourth metatarsal at 13 years age. 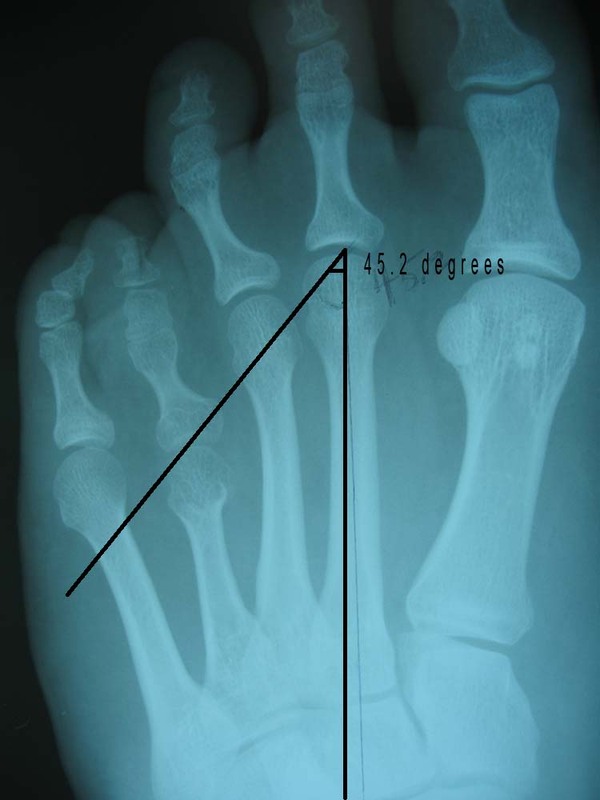 Radiographic evaluation reveals a congenitally short fourth metatarsal. (Fig. 2 A and B) The patient tried modifying her footwear, but with limited success. At initial visit, the patient was fitted with a digital Budin type splint in an attempt to help plantarflex the digit and eliminate pain. We also initiated dorsal digital padding to protect the toe while in the shoe. Most conservative measures were inadequate and we opted to bring the patient to surgery in order to correct the brachymetatarsia and lengthen the toe. The patient has an allergy to Suprax® and is taking Ibuprofen for pain and swelling. The patient has no medical conditions and is young and healthy. Surgery was discussed with the patient and mother. We described the two options for surgery including callus distraction with an external fixator or a one stage procedure including inter-positional bone graft. Because of her age and health status, we opted for the one stage lengthening. We also described the various types of grafting techniques including autogenous bone grafting from the patient’s own iliac crest to using allogenic, cadaver sterilized bone graft. Complications of this procedure were discussed including failure of graft material, vascular compromise to the fourth toe and metatarsophalangeal joint stiffness. Two weeks before her surgery, she was asked to manually place distal traction on the toe every night for about 5 to 10 minutes daily. Using blunt and sharp dissection technique, the mid-shaft region of the fourth metatarsal was identified. 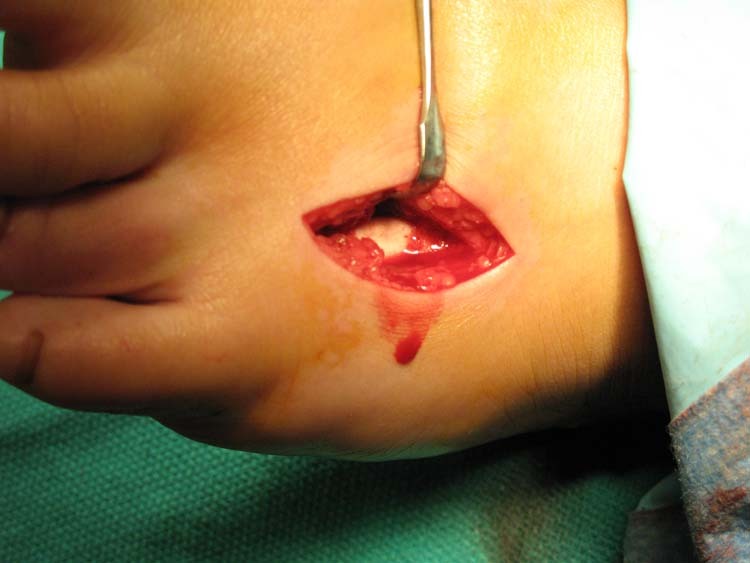 A small surgical bone saw was used to perform a transverse osteotomy through the metatarsal. This allows for gradual lengthening of the neurovascular structures of the fourth toe and promotes a gradual plastic deformation of the tissues. The metatarsal is gradually lengthened over 30 minutes to 1 hour. During this period, the graft can be shaped and prepared for implantation. It is important to realize that the fourth metatarsophalangeal joint will become inherently stiff and rigid during this process. The elastic properties of the surrounding tissues including the joint capsule will slowly begin to deform and relax. A too rapid distraction will cause soft tissue contracture leading to vascular spasm, so gradual distraction is recommended. During the hour of controlled distraction, the cadaver graft is prepared. It is important, when preparing the graft, that one take bone approximating the thickness and length of the metatarsal. We chose to use a humoral graft and cut a 20 mm section to approximate the size and shape of the metatarsal. 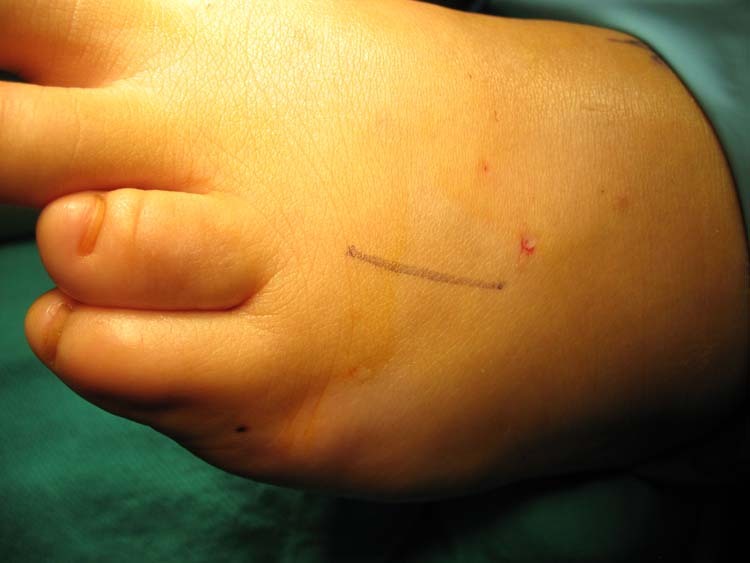 Although the metatarsal gap measured and desired length is measured at about 10 mm on radiograph, a larger graft is recommended to be initially used. 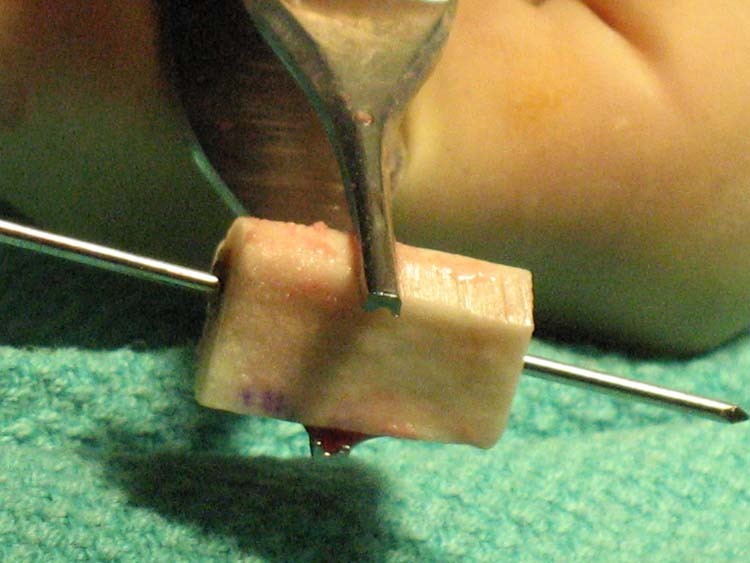 The graft is easier to handle and drill, then can be remodeled to a smaller size prior to insertion. Once the graft is to the desired shape, a .062mm Kirschner wire is used to drill a hole along the long axis of the graft. This is called pre-drilling the graft. This graft was completely cortical. Pre-drilling the graft will allow for easier placement in the final stages of the operation. When the distraction process is complete, the graft is now ready for placement. This stage can be technically challenging due to the persist tightness of the confined space. The graft often has to be re-shaped or slightly shortened for proper placement. That is why it is important to properly measure the distance of distraction prior to graft placement. At this point the laminar spreader is removed and the wire is reverse drilled along the distal portion of the metatarsal through the digit. The bone must be angled and care must be taken to not plantarflex the digit too much once pinned. After 2 weeks in a posterior splint and when the sutures are removed, the patient is placed in a short leg fiberglass cast for an additional 6 weeks. The entire immobilization period is about 8 weeks before partial to full weight bearing can resume. Radiographs performed at the end of 8 weeks reveals solid and complete incorporation of the graft along the metatarsal shaft. 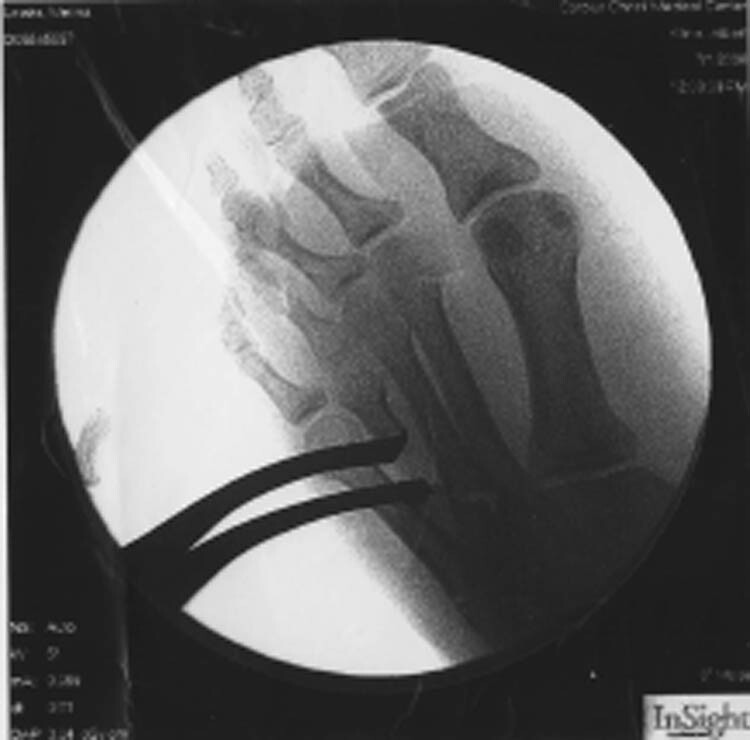 Figure 8 At 8 weeks, the bone graft shows signs of bone interposition and callusing. Deformation stress is noted along the proximal half of the 4th metatarsal, but does not compromise the overall shape of the metatarsal. Figure 9 After 6 months, the patient is very pleased with the restoration of metatarsal and toe length. There is excellent fourth metatarsophalangeal joint range of motion without pain or discomfort. 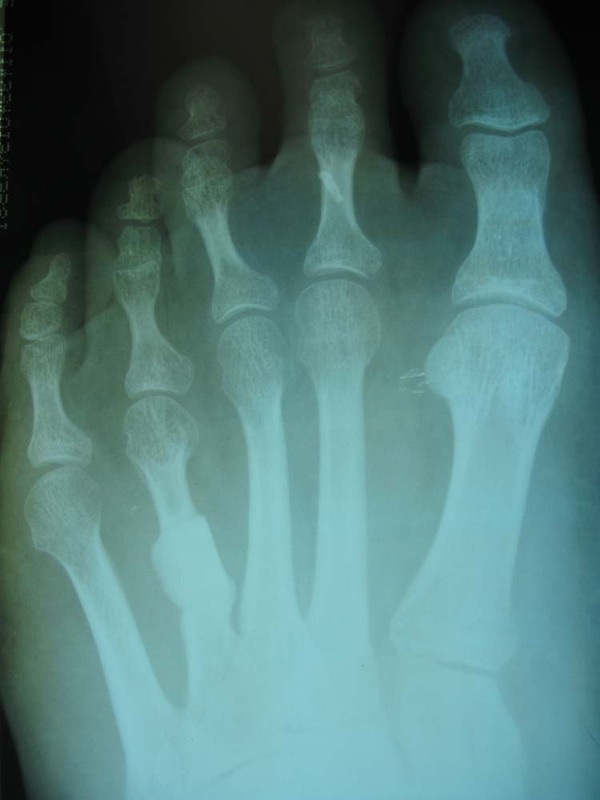 The author’s have found the use of an allogenic bone graft to have the same characteristics and properties as autogenous bone in one-stage metatarsal lengthening procedures, but without the need to harvest bone graft from the patient. They both have osteogenic, osteoconductive and osteoinductive properties. Osteogenic properties refer to the properties that promote the synthesis of new bone. Osteoconductive properties are those properties of the graft that provide framework where the formation occurs. Finally, osteoinduction is the ability of the graft to “stimulate the host precursor cells to form new bone through differentiation into chondroblast or osteoblast”. 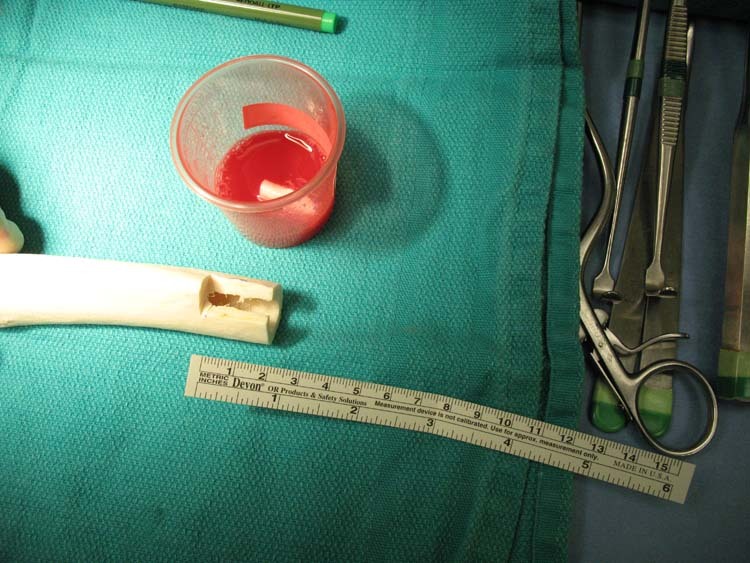 One of our concerns before surgery was whether the graft would incorporate as normal bone. 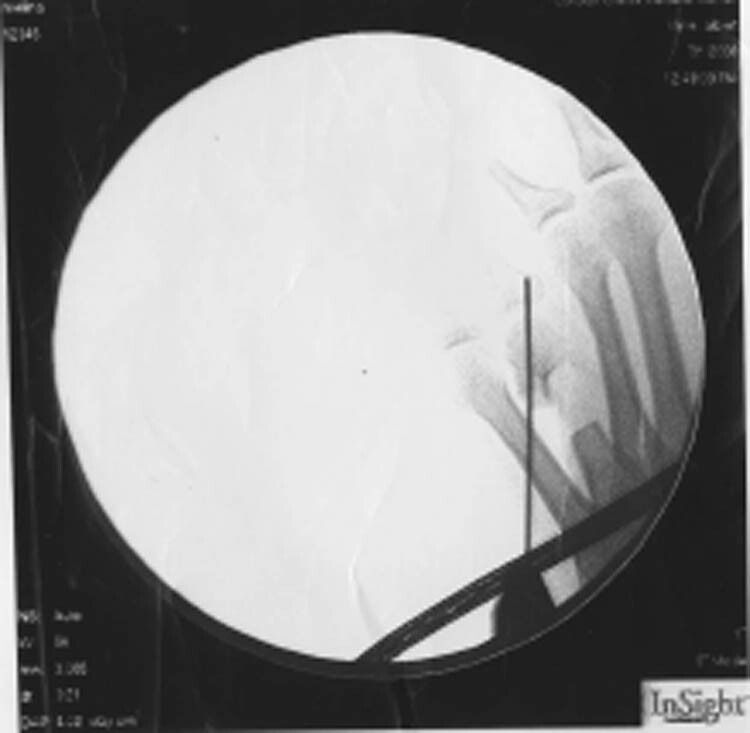 As previously mentioned, there are two techniques commonly used to treat brachymetatarsia: gradual distraction with external fixation and one-stage lengthening using bone grafts. It appears that gradual lengthening in the operating room using a laminar spreading and applying distraction stress gradually over 30 minutes to 1 hour will not cause vascular compromise. A number of studies have been reported on the viscoelastic properties of the surrounding soft tissues during metatarsal lengthening. [4,10] Stress relaxation will promote a lengthening of soft tissue when gradually performed, even in a relatively short period of time. A too rapid distraction of surrounding tissues will cause more contracture and vascular spasm with tissue compromise. 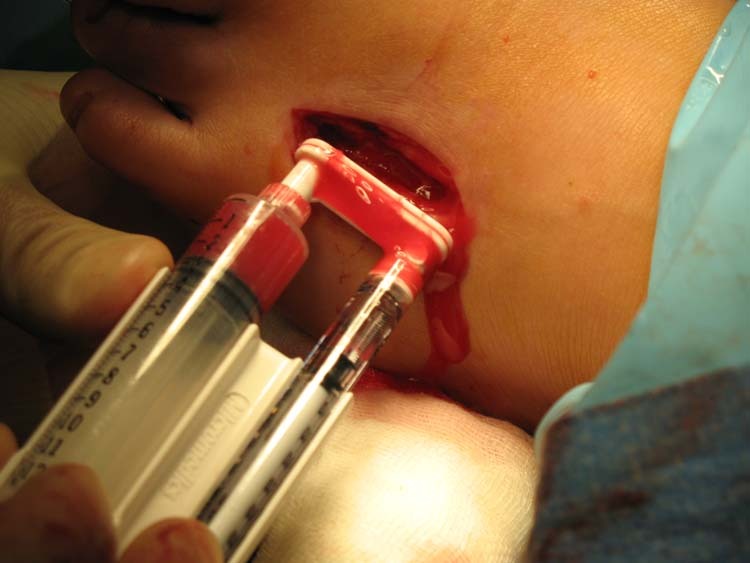 Using this gradual distraction technique with a simple laminar spreader, we were able to achieve over 10mm of lengthening within an hour without vascular compromise to the toe. An advantage to allogenic bone grafting is that there is no need to harvest bone from the patient, thus there is no donor site and a second surgery site. Having a second surgery site, or in this case, a donor site can potentially make surgery more complicated, and increase the risk of infection as well as creating increased pain along the donor site. It is very common for the donor site to be more painful after surgery than the recipient site, especially at the iliac crest. With allogenic bone, there is no donor site pain, no type matching or rejection, and the allogenic bone can be pre-shaped to decrease the surgery time. To our knowledge, this is the first reported successful correction of brachymetatarsia with complete incorporation of a cadaver allograft using the Biocleanse® sterilization process. In this case report, it appears the allograft incorporated well within the surrounding bone and tissue and provided this patient with adequate bone lengthening without the need for autogenous bone harvest. 1. Gilbody J, Nayagum S: Lengthening of the first metatarsal through an arthrodesis site for treatment of brachymetatarsia: A case report. Journal of Foot Ankle Surgery. 47 (6): 559 – 564, 2008. 2. Houshian S, Skov O, Weeth R: Correction of congenital brachymetatarsia by gradual callus distraction. Scand J of Plast Reconstr Surg Hand Surg. 36 373 – 375, 2001. 3. 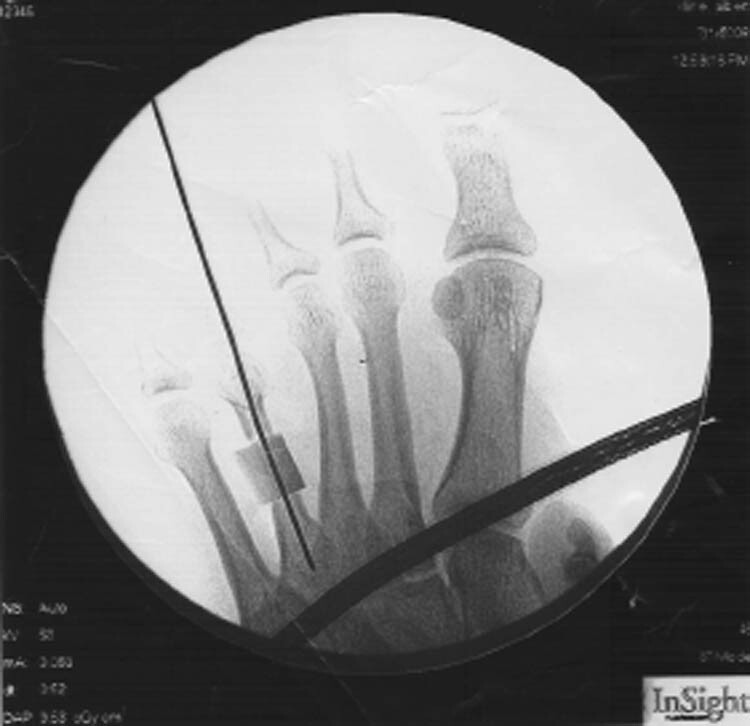 Pedro V. Munuera Martínez PVM, Guillermo Lafuente Sotillos G, Domínguez Maldonado G, Luis Salcini Macías J, Martínez Camuña L: Morphofunctional Study of Brachymetatarsia of the Fourth Metatarsal. J Am Podiatric Assoc . 94 (4) 347-352, July-Aug. 2004. 4. 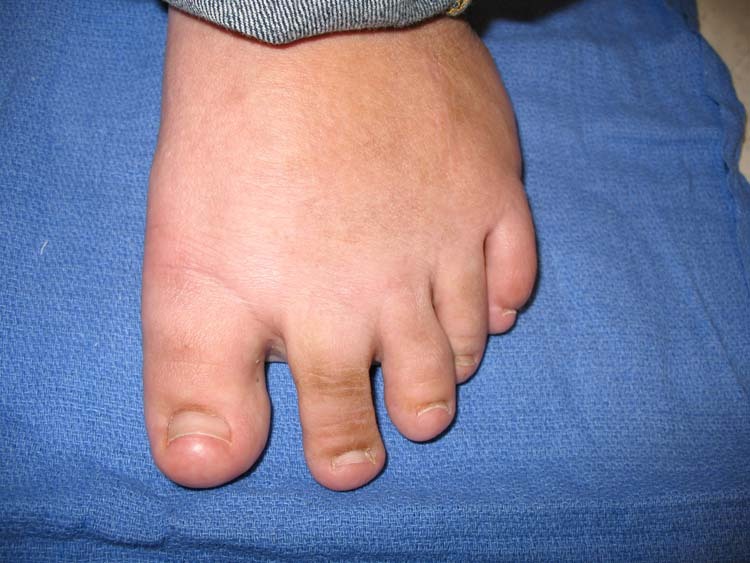 Goforth W. et al Brachymetatarsia of the Third and Fourth Metatarsals. J Am Podiatric Assoc. 91 (7) 373-378, 2001. 5. Wilusz P, Van P, Pupp GR: Complications associated with distraction osteogenesis for the correction of brachymetatarsia: A review of five procedures. J Am Podiatric Assoc. 97 (3) 189 – 194, 2007. 6. Allmendinger A, Yeghiayan P, Perone R, St. Vincent’s Medical Center in New York City: Case of the month. diagnostic imaging 31( 1) [online] Accessed February 7, 2009. 7. Kim HT, Lee SH, Yoo CI, Kang JH, Suh JT: The Management of Brachymetatarsia. Journal of Bone Joint Surgery. 85B (5) 661 – 665, 2003. 8. Kim J, Baek GH, Chung MS, Yoon PW: Multiple Congenital Brachymetatarsia: One-Stage Shortening and Lengthening Procedure Without Iliac Bone Graft. Journal of Bone Joint Surgery. 86B (7): 1013 – 1015, 2004. 9. Bone Graft Alternatives. North American Spine Society [online]Assessed February 15, 2009. 10. Baek GH, Chung MS: The Treatment of Congenital Brachymetatarsia by One-Stage Lengthening. Journal of Bone Joint Surgery. 80B (6): 1040 – 1044, 1998. 12. Finkemeier C. Bone-Grafting and Bone-Graft Substitutes. Journal of Bone Joint Surgery. 84A (3): 454-463, 2002. 13. Bostrom MPG, Seigerman DA: The Clinical Use of Allografts, Demineralized Bone Matrices, Synthetic Bone Graft Substitutes and Osteoinductive Growth Factors: A Survey Study. Hospital for Special Surgery, 2005 [online] Accessed March 21, 2009. 14. No author: A New Standard for Tissue Sterility. Regeneration Technologies (2006) [online] Accessed March 21, 2009. 15. No author: From Donation to Implantation. Regeneration Technologies (2006) [online] Accessed March 21, 2009. 16. No author: Biologics vs. other materials. Regeneration Technologies (2006) [online] Accessed March 21, 2009. 17. No author: Biologics Implants. Regeneration Technologies (2006) [online] Assessed March 21, 2009. 18. Sen MK, Miclau T: Autologous Iliac Crest Bone Graft: Should it Still be the Gold Standard for Treating Nonunions?. Injury. 38 (1) S75-S80 2007. 21. No author: Bone Healing (2008, May 26). 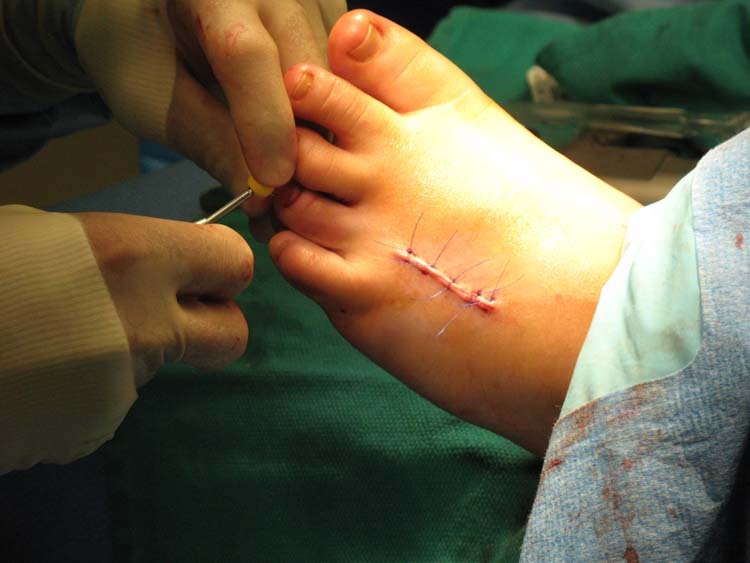 American College of Foot and Ankle Surgeons [online] Accessed April 15, 2009. 22. Mroz TE, Lin EL, Summit MC, Bianchi JR, Keesling JE Jr, Roberts M, Vangsness CT Jr, Wang JC: Biomechanical analysis of allograft bone treated by novel tissue sterilization process. Spine Journal 6 (1): 34 – 39, 2006. 2 Texas A&M Graduate (Hons), Corpus Christi, Texas, Incoming first year student, Barry University School of Podiatric Medicine.